As you all know, we are dedicated to providing you with impartial reviews so you can make the right choice when you are ready to purchase a new coffee maker. We have tried and tested a huge number of models and makes of coffee machines, and we couldn’t resist talking today about the Hamilton Beach 49980A. This machine is a unique machine in that it can be used to brew a full 12 cup pot, or it can also be used to brew a single serve cup using either ground coffee or a pod. Two ways to brew: Brew a single cup or a full or part pot. Two water tanks: The single serve tank is perfect for just one cup. The pot brewing tank is a large capacity tank complete with measurement markings for accurate filling. Single serve side has a mesh basket filter: This means that on the single serve side you don’t need filter papers. You simply pop your coffee grounds into the basket. It’s also compatible with coffee pods. Adjustable drip tray on the single serve side: Fits any cup size – simply move the drip tray to where you need it to accommodate your cup and prevent splashing. Brew strength selector: Choose from regular for a standard coffee taste or bold for a stronger, richer flavour. Programmable: You can set a timer anywhere within the upcoming twenty four hours to start your coffee brewing. This feature is available on the carafe side and the single serve side. It’s perfect for anyone who wants to wake up to the taste and smell of fresh coffee. An extended warranty of three or four years for a small additional fee. Simply add your coffee and water to the selected side. Push the selector button to the side you want to use and select from bold or regular and you’re good to go. This machine makes great tasting coffee and the options of pod, single serve ground coffee or a large carafe of coffee is a brilliant innovation. The programmable timer is easy to work and everything about this machine is designed with ease of use in mind. The ease of use, great tasting coffee and sleek design make a fantastic buy. Add in the fact that the Hamilton Beach 49980A retails for less than $70 and you’re definitely on to a winner with this one. The only real downside to this machine is that the pod holder isn’t compatible with Keurig K-cups which are probably the most popular and easiest pods to get hold of. The machine is compatible with Senseo pods. Why should I buy this machine? 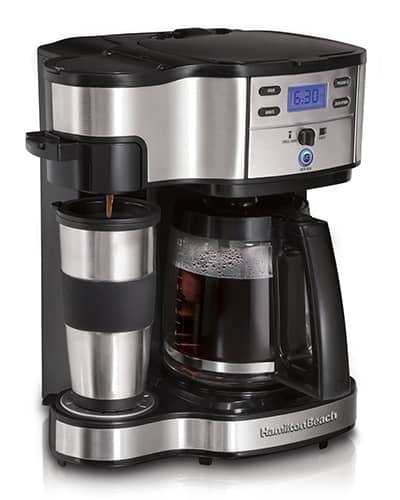 The Hamilton Beach 49980A is perfect for anyone who wants the option to make a single cup of coffee without the hassle of filling a large water tank and dirtying their carafe. It’s great for anyone with a large family or who entertains regularly because of the large capacity water tank and carafe. The single serve option is also a great addition for anyone who finds themselves entertaining a group with that one awkward person who will only drink decaf! Simply brew a pot of normal coffee, then make a single serve decaf option. Who should not buy this machine? Really, this machine is an ideal fit for most coffee drinkers. Even if you don’t think you would ever use the single serve/pod option, it won’t affect you just by being there, and with the great price and range of features, this machine is still a winner. If you are someone who only ever makes single serve coffees, then you might find a better option that only dispenses single serve, especially if you only like drinking Keurig K-cup pods. Overall, this machine is a good buy. The option for two ways to brew and serve makes it that little bit special and the ease of switching between the methods means it doesn’t ever have an adverse effect on your coffee making time. The machine is well designed, built to last and looks attractive and not bulky. Definitely one to consider. The option for two ways to brew and serve makes it that little bit special and the ease of switching between the methods means it doesn’t ever have an adverse effect on your coffee making time.The machine is well designed, built to last and looks attractive and not bulky. Definitely, one to consider.